- school children up to 18, friends of the CCIL museums, vocational schools, unemployed people : Free entry. 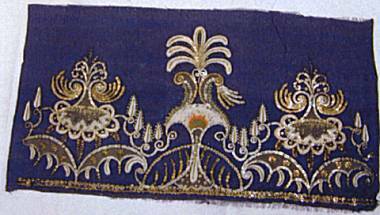 This exhibition is only one of the events commemorating the influence of Napoleon in and around Lyon and presents another aspect of the achievements of the period, the embroideries created for use in costume/fashion principally ornamented with flowers. It has been organised in honour of the 50th anniversary of the Centre International d'Etude des Textiles Anciens which was founded in 1954 at the Musée des Tissus, in Lyon. The CIETA brings together experts specialised in the study of textiles from throughout the world. 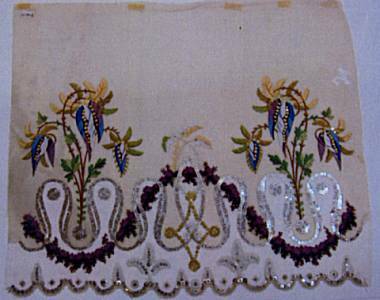 Important examples of embellishments for dress-hems and samples of embroidery for waistcoats or coats and preliminary designs, many of which are displayed for the first time, make up the major part of the exhibition. Most belong to the Museum's extensive Bergeret and Belmont collection (1884). 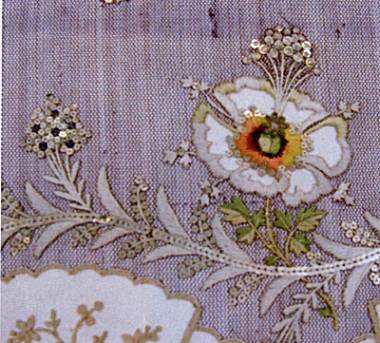 The exhibition opens with a water-colour design for a dress-hem featuring a garland of flowers, typical of the late 18th century. A handwritten note accompanying the design reads : " A Gros de Tours impérial can be substituted for the carmelitte colour if Her Imperial Highness so desires ". Not only does this document provide definitive evidence of the date of the design, it also highlights the inherent ambiguity of the time ; a period both of upheaval and continuity. While most of the artefacts are in excellent condition the transitional nature of the decorative motifs makes them difficult to date with certainty. A common denominator resides in the extravagant use of flowers in their composition. It is well-known that Joséphine had a passion for botany, gardening and rare plants as can be seen in the work of Redouté displayed here. She not only dictated fashion but also imposed her taste on it. 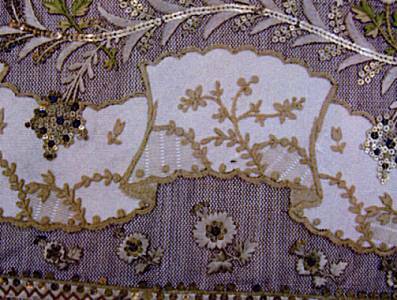 The embroideries shown here sprang from her passion for all things floral.